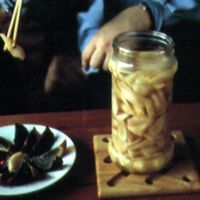 Pickled ginger is an obligatory accompaniment to Asian cuisine. Young ginger is only available in the spring, if possible use Hawaiian baby ginger for this preparation, as it is very tender and almost fiberless, with thin, papery skin. Murabba is a sweet-savory jam pickle common in Indian and Pakistani cuisines. This version uses ripe nectarines and a touch of rosewater for a fragrant condiment that's equally at home on toast or stirred into yogurt as it is accompanying grilled meat or fish. Blanch the ginger in a large pot of boiling water for 2 minutes. Drain, then sprinkle with coarse salt. Mix well, and set aside for 1 hour. This will draw the moisture out of the ginger. Strain off the liquid, then squeeze the ginger and drain well. Heat apple cider vinegar in a medium saucepan over low heat. Add sugar and stir until dissolved. Remove from heat and set aside to cool. Pack the ginger into sterilized jars, pour the vinegar over the ginger, seal, and store in the refrigerator. The ginger will be ready to eat in 1 week and will last refrigerated for at least 3 months. Always use a clean utensil to remove ginger from the jar.